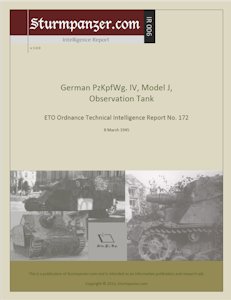 Intel Report on the Pz.Kpf.Wg. IV, with 5 photos. "A Pz Kpfw.IV "OP" Tanks (Pz. Beob. Wg. IV) recovered in Belgiun, has been examined. It is a normal Pz. Kpfw IV Model J Tank,mounting the 7,5 cm. Kwk 40 (L/48) gun. With few exceptions, the tank conforms to Model H tanks previously examined."